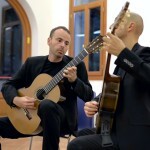 Italian guitar duo: SoloDuo (Lorenzo Micheli & Matteo Mela) play Sonata K 386 by Domenico Scarlatti (1685–1757). Son of his renowned father Alessandro Scarlatti, Domenico was an Italian composer who spent much of his life in the service of the Portuguese and Spanish royal families. He is well known mainly for his 555 keyboard sonatas. I like how SoloDuo sit close and really watch each other closely. Fast and clear playing with a great tempo. What a funny sonata with all those scales, the dynamics might be a bit distracting but still effective. Video and sound produced by the amazing Canadian guitarist / audio-visual producer Drew Henderson.